Russell Irving Tamblyn (born December 30, 1934) is an American film and television actor and dancer. Born and raised in Los Angeles, Tamblyn was trained as a gymnast in his youth. He began his career as a child actor for Metro-Goldwyn-Mayer. Tamblyn appeared in the musical Seven Brides for Seven Brothers (1954). He subsequently portrayed Norman Page in the drama Peyton Place (1957), for which he earned an Academy Award nomination for Best Supporting Actor. This led to Tamblyn being cast in leading roles, such as in the crime film High School Confidential (1958), and in the title role of Tom Thumb (1958). Tamblyn's gymnastic and acrobatic talents were showcased in several other musicals, including West Side Story (1961), in which he portrayed Riff, the leader of the Jets gang. The success of West Side Story led to additional leading roles, including parts in the horror film The Haunting (1963), directed by Robert Wise, and the Japanese science fiction film The War of the Gargantuas (1966). 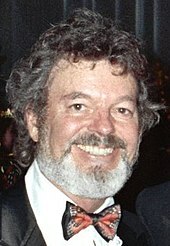 Throughout the 1970s, Tamblyn appeared in several exploitation films and worked as a choreographer in the 1980s. In 1990, he starred as Dr. Lawrence Jacoby in David Lynch's television drama Twin Peaks, reprising the role during its 2017 revival. Tamblyn was born December 30, 1934 in Los Angeles, California, the son of actors Sally Aileen (Triplett) (1912–1995) and Eddie Tamblyn (Edward Francis Tamblyn) (1908–1957). He has one younger brother, Larry Tamblyn, who was the organist for the 1960s band, the Standells. Tamblyn was a "hyperactive" child and had a penchant for gymnastics and performing. As a child, he would take the stage during intermissions at the local movie theater and do tumbling performances. Tamblyn wanted to be a circus performer and was skilled in acrobatics and dancing as a child. He developed a musical act that involved singing, dancing, juggling and comedy. Discovered at the age of ten by actor Lloyd Bridges after acting in a play, Tamblyn first appeared on film in a small non-speaking role in The Boy With Green Hair (1948). Also as a child, he appeared on The Ed Sullivan Show. Tamblyn was given a large role in The Kid from Cleveland (1949), billed third (as "Rusty Tamblyn") under stars George Brent and Lynn Bari. The movie was not a large success but established Tamblyn as a film actor. He could be seen in small roles in Reign of Terror (1949), Cecil B. DeMille's 1949 version of Samson and Delilah (where he played young Saul), and the short What Happened to Jo Jo? (1950). He played the younger Bart Tare (played as an adult by John Dall) in the film noir Gun Crazy (1950); around the same time, he had a minor role as Elizabeth Taylor's younger brother in Father of the Bride (also 1950) and appeared in its sequel, Father's Little Dividend (1951). Tamblyn could also be seen in Captain Carey, U.S.A. (1950), The Gangster We Made (1950), As Young as You Feel (1951), Cave of Outlaws (1951), Retreat, Hell! (1952), and The Winning Team (1952). MGM had been impressed by Tamblyn's performance in Retreat, Hell! and signed him to a long term contract. His first role under the new contract was as a young soldier in boot camp in Take the High Ground! (1953), directed by Richard Brooks. His training as a gymnast in high school, and abilities as an acrobat, prepared him for his breakout role as Gideon, the youngest brother, in Seven Brides for Seven Brothers (1954). He was not a trained dancer and always considered himself an actor who danced rather than the other way around but the film was a big success and established him at MGM. Tamblyn was one of many studio contract players in the musical Deep in My Heart (1954). He played Eleanor Parker's brother in the Western Many Rivers to Cross (1955), and was one of several young MGM actors (others included Jane Powell and Debbie Reynolds) in the musical Hit the Deck (1955). Tamblyn supported older actors in two Westerns: Robert Taylor and Stewart Granger in The Last Hunt (1956), a flop; and Glenn Ford and Broderick Crawford in The Fastest Gun Alive (1956), a big hit, where he performed an extraordinary "shovel" dance at a hoe-down early in the film. He served (uncredited) as a choreographer for Elvis Presley in 1957's Jailhouse Rock. MGM loaned Tamblyn to Allied Artists for his first star role, The Young Guns (1957). Back at MGM he supported Glenn Ford and Gia Scala in Don't Go Near the Water (1957), a comedy set amongst members of the U.S. Navy. 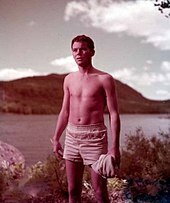 Tamblyn portrayed Norman Page in the film of Peyton Place (1957) at 20th Century Fox, opposite Lana Turner and Diane Varsi. For his performance in the film he received an Academy Award nomination for Best Supporting Actor. He was then given a star role at MGM, playing Tony Baker in High School Confidential (1958). The film was a solid hit. Also successful was the musical Tom Thumb (1958) made for George Pal, in which Tamblyn was cast in the title role. Tamblyn's career momentum was interrupted when he was drafted into the US army in 1958. On his return MGM gave him an excellent support part in Cimarron (1960), supporting Glenn Ford. Tamblyn's best known musical role came as Riff, the leader of the Jets street gang in West Side Story (1961). He then appeared in two MGM Cinerama movies, The Wonderful World of the Brothers Grimm and How the West Was Won (both 1962). He was seen as Luke Sanderson in The Haunting, and as Lt. "Smitty" Smith in MGM's Follow the Boys (both 1963). Tamblyn was unable to consolidate his position as a leading man, and he later recounted that he "dropped out" after his West Side Story success, that he devoted himself to art and turned down movie roles as well as a role in the TV series Gilligan's Island. In the 1960s he appeared in the TV series The Greatest Show on Earth ("Silent Love, Secret Love") (1963), and Channing ("The Last Testament of Buddy Crown")(1963). Tamblyn played a Viking alongside Richard Widmark and Sidney Poitier in The Long Ships (1965). He was in Burke's Law ("Who Killed Rosie Sunset?") (1965), and Gunsmoke ("He Who Steals") (1965). He also appeared in Days of Our Lives (1965). Tamblyn was giving the star role in a low budget Western for MGM Son of a Gunfighter (1965) and starred in the 1966 Japanese kaiju film War of the Gargantuas. He guest starred on Tarzan ("Leopard on the Loose") (1966), andIron Horse ("Decision at Sundown") (1967). Tamblyn later admitted he became "bored" with acting around this time and more interested in art. Tamblyn starred in a notorious biker movie Satan's Sadists (1969) for Al Adamson. He followed it with Scream Free! (1969), The Last Movie (1971), The Female Bunch (1971) and Dracula vs. Frankenstein (1971) for Adamson. He appeared on TV in Cade's County ("Ragged Edge") (1972), Win, Place or Steal (1973), The World Through the Eyes of Children (1975), The Quest ("The Captive") (1976), The Life and Times of Grizzly Adams ("The Skyrider") (1978), and Nero Wolfe ("Before I Die", 1981). He was also in the film Black Heat (1976). At the same time he worked in exploitation, Tamblyn also worked in the construction industry and computer software. Tamblyn played the supporting role in Neil Young's 1982 Human Highway while also credited for screenplay and choreography. Tamblyn is credited as director, choreographer and actor for Neil Young's Greendale concert tour. He choreographed a play Man with Bags in 1983. He could be seen in Fame, Commando Squad (1987) for Fred Olen Ray, The Phantom Empire (1988), Necromancer (1988), B.O.R.N. (1988), The Bloody Monks (1988), and an episode of Quantum Leap. He was in Aftershock (1990), and Wizards of the Demon Sword (1991) for Fred Olen Ray. In 1990–91, Tamblyn starred as Dr. Lawrence Jacoby on the David Lynch-created series Twin Peaks (alongside his West Side Story co-star Richard Beymer, who played Ben Horne); his scenes in the 1992 prequel film Twin Peaks: Fire Walk with Me were cut. He could be see in Running Mates (1992), Little Devils: The Birth (1993), Cabin Boy (1994), Desert Steel (1995), and Babylon 5. He appeared on stage in Los Angeles in Zastrozzi. His work drifted back to straight to video: Starstruck (1995), Rebellious (1995), Attack of the 60 Foot Centerfold (1995) and Invisible Mom (1996) for Fred Olen Ray, Johnny Mysto: Boy Wizard (1997), My Ghost Dog (1997), and Little Miss Magic (1998) for Ray. He appeared on another soap opera, General Hospital, alongside his daughter Amber in 1997 and 2000. In 2004, he appeared with Amber again, playing God in the form of a man walking dogs, in three episodes of Joan of Arcadia. The two also have worked together in the films Rebellious, Johnny Mysto: Boy Wizard, and The Increasingly Poor Decisions of Todd Margaret. And in Quentin Tarantino's film Django Unchained, they were billed respectively as "Son of a Gunfighter" and "Daughter of a Son of a Gunfighter", alluding to his leading role in the 1965 western Son of a Gunfighter. In 2004, the Academy Film Archive preserved the mid-1960s works First Film and Rio Reel by Tamblyn. Tamblyn has had supporting roles in Drive (2011), Django Unchained (2012), and Hits (2014). He appeared several times in The Increasingly Poor Decisions of Todd Margaret, and in the revival of Twin Peaks (2017). Tamblyn married actress Venetia Stevenson in 1956, but the couple divorced the following year. He married Elizabeth Kempton, a showgirl, in Las Vegas in 1960. He and Kempton had one child, daughter China, before divorcing in 1979. His second child, actress Amber Tamblyn, was born in 1983 to his third wife Bonnie Murray. In 2012, it was announced that he was working on writing an autobiography, titled Dancing On The Edge. Tamblyn underwent open heart surgery in October 2014. There were complications following the surgery and during the rehabilitation, although his health had reportedly improved as of February 2015. 1963 The Greatest Show on Earth Tom Tuttle Episode: "Silent Love, Secret Love"
1963 Channing Hal Langley Episode: "The Last Testament of Buddy Crown"
1965 Burke's Law Maximillian Episode: "Who Killed Rosie Sunset?" 1965 Gunsmoke Billy Waters Episode: "He Who Steals"
1966 Tarzan Bell Episode: "Leopard on the Loose"
1967 Iron Horse Kehoe Episode: "Decision at Sundown"
1969 The Name of the Game John Earl Episode: "A Hard Case of the Blues"
1972 Cade's County Brewster Episode: "Ragged Edge"
1976 The Quest Kelly Episode: "The Captive"
1978 The Life and Times of Grizzly Adams Milton Wright Episode: "The Skyrider"
1981 Nero Wolfe Episode: "Before I Die"
1987 Rags to Riches Roger Episode: "Vegas Rock"
1989 Quantum Leap Bert Glasserman Episode: "Thou Shalt Not..."
1994 Babylon 5 Capt. Jack Maynard Episode: "A Distant Star"
1997 Nash Bridges Jim the Penman Episode: "The Counterfeiters"
2018 The Haunting of Hill House Dr. Montague Episode: "The Bent-Neck Lady"
^ Willis & Monush 2010, p. 405. ^ Cullen, Hackman & McNeilly 2006, p. 1085. ^ a b c d "Russ Tamblyn Biography". Turner Classic Movies. Retrieved June 10, 2018. ^ a b c d Lamparski 1985, p. 172. ^ "The Life Story of RUSS TAMBLYN". Picture Show (64): 12. June 18, 1955 – via ProQuest. ^ Hopper, Hedda (October 23, 1955). "Russ tamblyn rose fast the slow way". Los Angeles Times – via ProQuest. ^ Schallert, E. (June 26, 1953). "Norman corwin to script 'Holy Grail'; Tamblyn captures star chance". Los Angeles Times – via ProQuest. ^ a b c Wheelock, J. (February 20, 1983). "DANCEWATCHING". Los Angeles Times – via ProQuest. ^ Hopper, Hedda (April 9, 1955). "Sinatra and Debbie Reynolds to Co-Star in 'Tender Trap'". Chicago Daily Tribune. p. 12. ^ By, R. N. (February 29, 1956). "Dancer? tumbler? actor?". The Christian Science Monitor – via ProQuest. ^ Hopper, Hedda (September 21, 1958). "HE'S IN THE ARMY NOW!". Chicago Daily Tribune – via ProQuest. ^ Hughes, Mike (2 August 1990). "Russ Tamblyn Has 'Peak' Performance". Lansing State Journal. p. 74. Retrieved 29 September 2018 – via Newspapers.com. ^ a b Brown, Joe (August 3, 1983). "Tumblin' Tamblyn". The Washington Post. ^ Wheelock, Julie (6 April 1990). "'Twin Peaks' Stars Tamblyn, Beymer Share Twin Experience : Television: Actors at work on ABC series share a common bond . . . their roles in 'West Side Story' almost 30 years ago". LA Times. Archived from the original on 14 April 2018. Retrieved 7 January 2019. ^ Stayton, Richard (September 17, 1993). "Savvy cast can't shed light on 'Zastrozzi'". Los Angeles Times – via ProQuest. ^ Tribune, M. S. (September 9, 2000). "Russ Tamblyn Joins Daughter on 'GH'". Chicago Tribune – via ProQuest. ^ Ferguson, LaToya (14 January 2016). "Todd Margaret is forever doomed if he does, doomed if he doesn't". The A.V. Club. Onion, Inc. Retrieved 7 January 2019. ^ "Who's who in Twin Peaks Season 3: The Return? A character guide for the confused". Telegraph. Telegraph Media Group Limited. 13 June 2017. Retrieved 7 January 2019. ^ Lamparski 1985, p. 165. ^ "People: Marriages". The Cincinnati Enquirer. May 10, 1960. p. 3 – via Newspapers.com. ^ "Milestones". Time. May 23, 1960. Retrieved June 9, 2018. ^ Beck, Kim (October 28, 2012). "'West Side Story' Star Russ Tamblyn". American Profile. Retrieved June 9, 2018. ^ "David Lynch And Mark Frost Want Russ Tamblyn Back As Dr. Jacoby In The New Twin Peaks!". February 24, 2015. Cullen, Frank; Hackman, Florence; McNeilly, Donald (2006). Vaudeville Old & New: An Encyclopedia of Variety Performances in America. Psychology Press. ISBN 978-0-415-93853-2. Lamparski, Richard (1985). Whatever Became Of ... ? (9th ed.). Crown. ISBN 978-0-517-55540-8. Willis, John; Monush, Barry, eds. (2010). Screen World 2007. 58. Hal Leonard Corporation. ISBN 978-1-557-83729-5.